I am loading for a 257AI and need to settle on a single load. The purpose of this rifle/cambering is Pronghorn and deer both mulies and whitetail. My thoughts are along the line of the 115gr Partition for deer here in the northeast and elsewhere, with a 115 gr BTBT for Antelope. I was looking at the Barnes TTSX in 100 gr and was wondering what you guys thought of that bullet as a one bullet for all load ? This would be about a 3,200 fps load. I have zero experiance with Barnes. Thoughts or observations would be great. I have one load form my 25-06 for deer & antelope. I load the Sierra Game King 117 BT. I have used this bullet for 30 years or so. My loads MV is about 3250 fps. Does a great job .....no need to change. I am shooting a 25-06 with 100 grain Barnes TTSX bullets at 3200 fps and love it. It gives me great accuracy with the loads with the speed that I want. I just looked at the Barnes on line load data and it shows with a 100 grain TTSX you can get 3200 fps with a few different powders in the AI. As for the 100 grain TTSX it does a great job on coues deer, I haven't had a chance to try it out on a antelope yet. 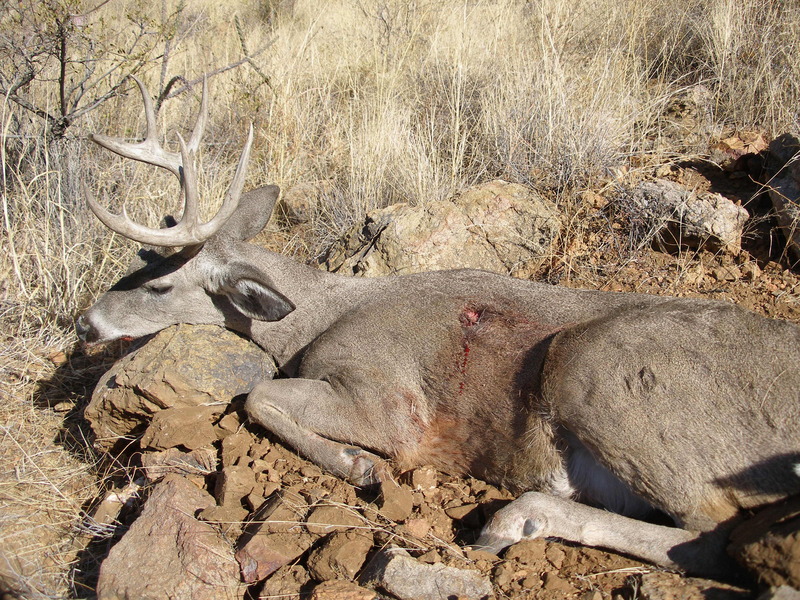 I shot the coues in my avatar at 420 yards with a 100 grain TTSX at 3200 fps. My top would be the 100gr Sirocco followed by the 110 Accubond for deer. The all metal bullets work well too, I just prefer a little more expansion and bigger wound channel on deer. A buddy shoots the 110 Accubond from his 257 Weatherby at 3400fps and I've seen it take out a big whitetail's front shoulder at 80 yards and exit the other side without looking like it exploded. The Sirocco is a little tougher, little higher BC, and a little lighter for better speed. There are lots of good choices, the TTSX, E Tip, Interbond, GMX, lots of them should work well. That 117gr Sierra Gameking is also a good one. One bullet I would definitely NOT use is a Nosler Ballistic Tip. Here is a picture of ant antelope with a destroyed shoulder on an entrance wound. My .257 Wby with a 115 gr BT Nosler. I have had similar experiences with Weatherby magnums and ballistic tips. They work really well on lung shots but explode on the shoulder. I was using 165 grain ballistic out of my 300wby. Never used them in my 257wby but my nephew used them on a mule deer hunt and had the same result as your antelope. Definitely a lot bigger mess than the Accubond made on the buck my buddy shot. I was pretty shocked how well it held up at that speed with the bone he hit. 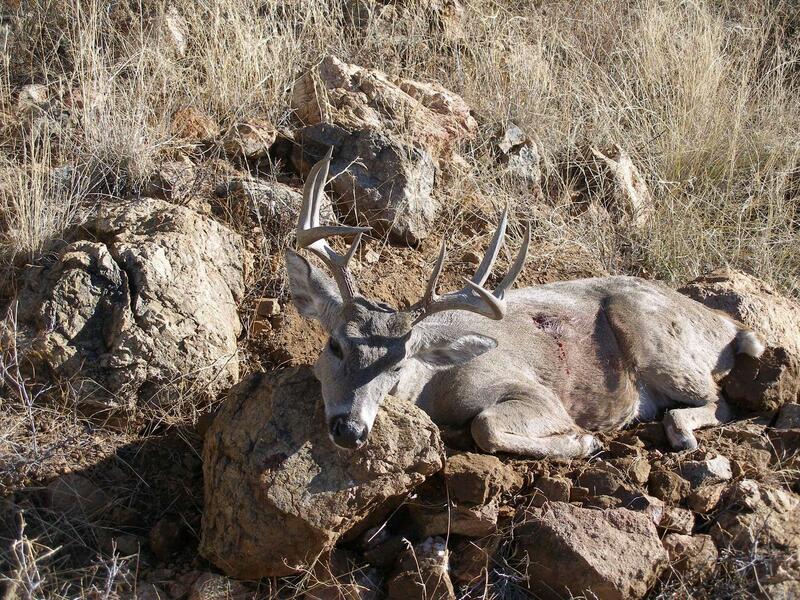 That's a darn nice Coues JimP! I’d not hesitate to use the TTSX if your gun likes them. They excel in light for caliber bullets pushed fast. Another bullet I’ve had great luck with, not yet mentioned, out of my 25-06, is the Hornady Interlock 117. Many good bullets are available.